Now peace negotiations between the FARC and the Colombian Government has begun in Havana, the mainstream media is writing a lot about the Colombian conflict. You can read many background articles and analyses on the conflict, however few will give you an accurate and complete overview. The conflict has become very complicated in the 64 years of its existence. 64 years, because I would like to add the 10 years of "La Violencia" (1948-1958). Right after La Violencia, the state began to orchestrate hostilities against socialists. During La Violencia approx. 250,000 people lost their lives and another 250,000 lost their lives in the years after. In those 64 years more actors and forces entered the conflict arena, making the conflict more complicated and therefore ever more difficult to resolve. For a better understanding, I will try here to visualize through diagrams the most important actors and forces of the conflict. Forces and actors have varied in time and strength of course. Violence is of course the most visible force of the conflict. 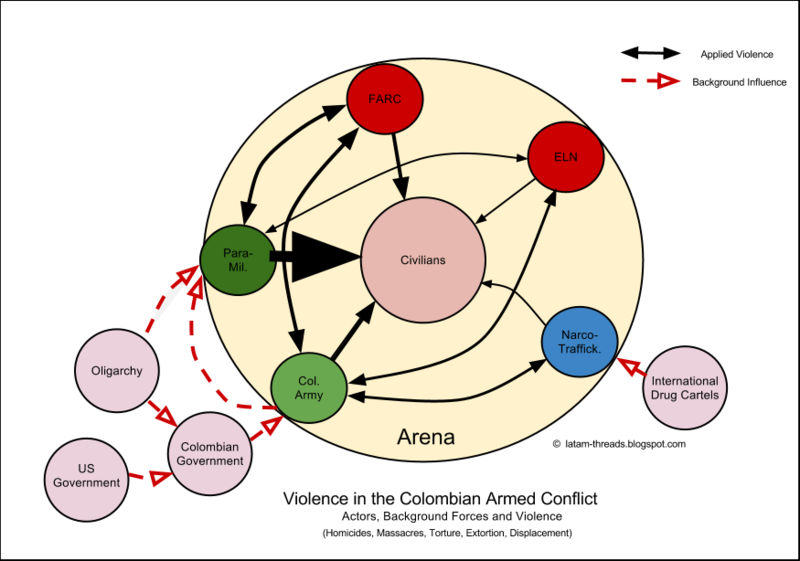 In the diagram below you'll find the most important actors that use violence in the conflict. It's understandable that the military used direct violence in combating the insurgent troops and criminal groups. Never the less the military killed many civilians in the crossfire and were also responsible for many deliberate killings. For example the approx. 3,000 extrajudicial killings of civilians during the Uribe administration, which were called "falsos positivos" by the state and media because the bodies were dressed up as guerrillas by the military. According to www.verdadabierta.com the paramilitaries were/are responsible for most of the violence from 1980-2011 (the period before 1980 is undocumented). They worked covertly together with and were backed by the military, oligarchy and the state. Especially the civilians living in the front-lines suffered the most. If they weren't displaced or weren't extorted, they were regularly accused of (forced) collaboration with the other party and often had to pay with their life. As a side-effect, many of the approx. 5 million displaced campesinos (IDP's) had to settle themselves in the slums of the big cities and because of absence of jobs and social security, crime and more violence had to evolve. The state discovered that (International) public opinion regarding the armed conflict became ever more important. Through the years radio, television, mobile phones, handy-cams and the Internet came available and could influence public opinion the wrong way according to the armed actors of the conflict. Therefore information had to be covered, bend or made up by the armed actors and the methods had to become more sophisticated. 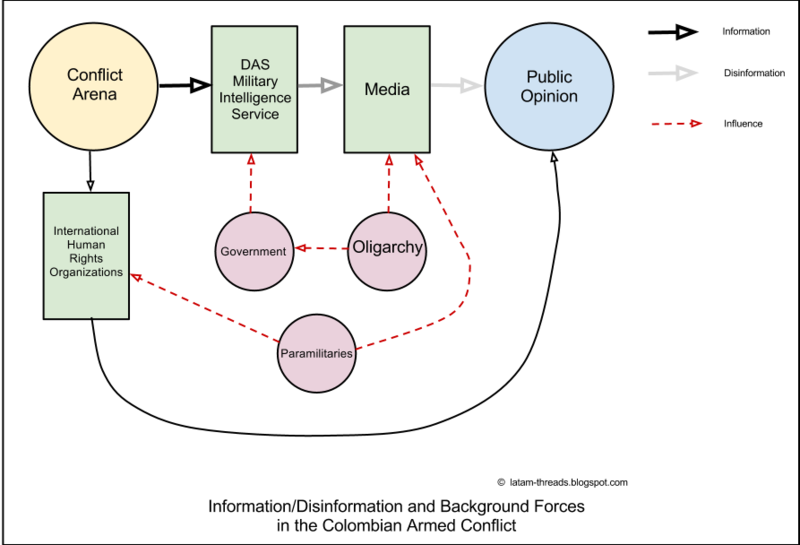 The diagram above shows how most information regarding the conflict is exclusively handled by the DAS (renamed DNI since Oct. 2011) and becomes disinformation. The mainstream media in Colombia is mostly owned by the oligarchy and reporting of the conflict is therefore usually not offensive to business owners. Also, the media companies don't want to loose their advertisers. The paramilitaries have threatened and killed many reporters who were critical about their actions. As a result reporters became careful and applied self-censorship. Human Rights Organizations have managed to reveal many atrocities, but HRO-workers have been threatened and killed by the paramilitaries as well. FARC and ELN have very limited information outlets available except for their websites, which have been blocked and hacked several times. They publish the losses of every encounter with the enemy, but the figures never match with those of the Colombian Army. 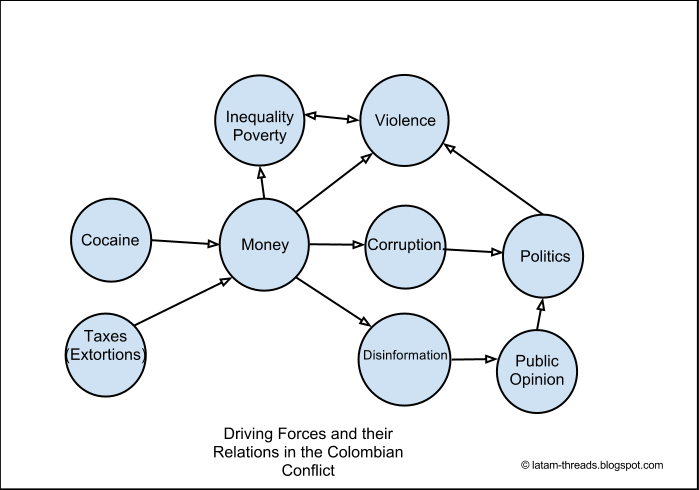 If you look at the diagram above you'll notice that the conflict is primarily financed by taxes and cocaine profits. If you could take the cocaine profits away (for example by regulating and legalizing it), the conflict might weaken for a short period of time, but likely some other source of illegal financing would be found by the BACRIMs and insurgent troops. FARC and ELN (used to) spend (lots of) money on social programs like schools, infrastructure and health clinics. The BACRIMs are selling their services to the oligarchy (former drug barons) and the BACRIM-officers will get rich of the cocaine profits and usually become oligarchy themselves in time. The small farmers are producing coca in FARC or BACRIM controlled rural territories. If they can afford to buy the chemicals, small farmers usually produce the coca paste themselves, because it is easier to transport than big bags of dried leaves. The coca paste process is easy and the chemicals you need are cement, ammonia, gasoline, quick lime and sulfuric acid. Producing coca paste can double your profits as a farmer. The cocaine labs are mostly run by FARC and BACRIMs. The cocaine process is using chemicals like acetone, potassium permanganate and hydrochloric acid also heat and electricity and is dangerous because of the fumes and fire hazard. The cocaine is guarded and transported by the Colombian narco-traffickers to the shipping points of the International (Mexican) drug cartels, who will smuggle and distribute it into the US and Canada. The main driver of coca cultivation and cocaine production in Colombia is the demand of the North American market. 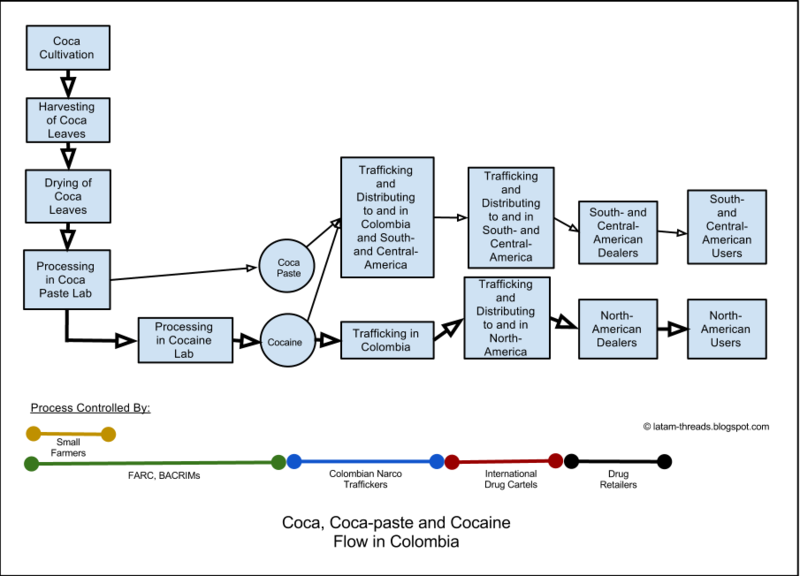 According to DEA’s Cocaine Signature Program, Colombia produces virtually all of the cocaine seized in the U.S. (95%). From those figures you might conclude that the expensive U.S. Plan Colombia had little effect on US imports. Colombia produces slightly more than the North-American market demands. So a small part of Colombian cocaine and coca paste will go to Central- and South-American markets too. Colombian coca paste products like dry, washed and waste coca paste a.k.a. paco, bazuco or pitillo are increasingly exported to and consumed in other South- and Central-American countries, because it's much cheaper (and more addictive). 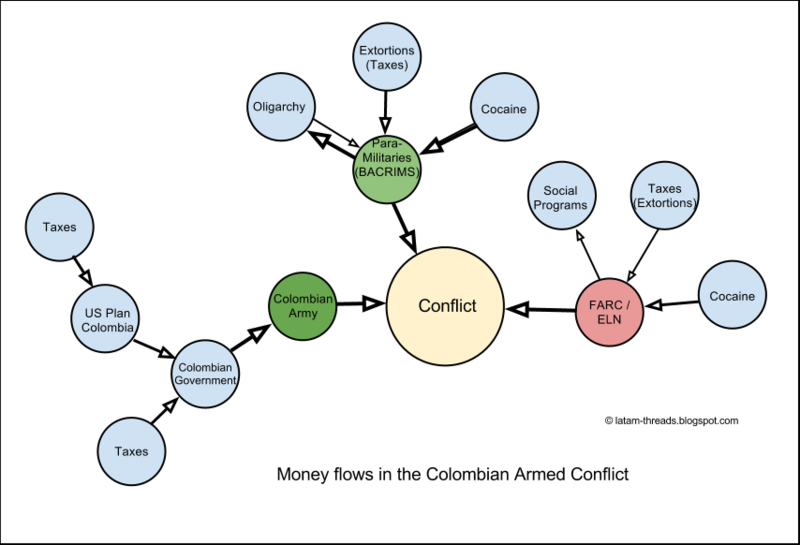 There is another driving force in the Colombian conflict: Corruption. Corruption is increasing in Colombia for quite some years again. Corruption sabotages democracy because what counts is who is able to bribe most politicians and officials (usually the ruling oligarchy). All the driving forces of the conflict with their relations can be brought together in one diagram as you can see below. The money that the Cocaine business generates, creates more oligarchy, more poverty and more violence. But the money creates also more corruption and the political conditions that fuels the violence. It creates also more direct violence, more IDP's and therefore more poverty.